Due to Reykjavík’s location in the southern part of Iceland, most of the popular tourist destinations in the country are the waterfalls, glaciers, and volcanic features in that part of the country. So, as we continued our counter-clockwise loop around Iceland into the north, the crowds of tourists were smaller, and we were still able to find more stunning scenery while finding out a little more about the culture of Iceland itself. Our first stop after leaving Mývatn was another beautiful, glacier-fed waterfall. Goðafoss, meaning “waterfall of the gods,” is named so because after Iceland’s official religion was changed to Christianity at the Alþingi in the year 1000, the lawspeaker threw his statues of the Norse gods into the waterfall. You can park on either side of the waterfall; we chose the east side. Goðafoss is very pretty, with crystal blue water, but the gnats here were very persistent so we didn’t linger very long. There is a smaller series of waterfalls just downstream that are also worth taking a look at. The Ring Road then passes through the city of Akureyri, Iceland’s second largest urban area. We parked our campervan for free near the fancy Hof Cultural and Conference Center. We wandered through the small and cute main part of the central business district, and climbed the stairs to Akureyrarkirkja, the main Lutheran church in town. We found a relatively cheap burger place called DJ Grill and got some tasty burgers for lunch before hitting the road again. We next took a detour off of the Ring Road to drive the edge of the Tröllaskagi (“Troll”) Peninsula, a mountainous finger of land jutting out into the ocean with fjords on either side. Unfortunately, the gloomy weather didn’t let the area show off its best side, but we did enjoy the views we could see. We also experienced a few one-lane tunnels, which were pretty nerve-wracking to go through! They weren’t controlled by lights at all; instead, traffic both ways used the same lane with pullouts every few hundred meters to help solve the issue of two cars meeting head on. Nerve-wracking to say the least! A two-lane tunnel. We were too tense to get a picture of a one-lane tunnel! We stopped along the way in the town of Siglufjörður to visit the Herring Era Museum. In the first half of the 20th century, herring was a huge part of Iceland’s economy. Siglufjörður itself, located on a fjord near some of the best catching grounds, became a boomtown, with thousands of laborers flocking to the town and working in the catching or processing of herring. However, in the 1950s, the herring numbers precipitously declined, and by 1969 they were gone, and Siglufjörður’s golden period ended. Three of the old buildings from the herring era have now been converted into an immersive museum allowing you to get a feel for what that time in Iceland and Siglufjörður was like. The first building, an old salting station, has exhibits on the history of the herring trade, and then on the upper levels has recreated the dormitories where the “herring girls,” the seasonal workers who came to the town to work in the summer, and the herring fishermen were housed. The second building, an old herring factory, has exhibits and old machinery demonstrating how herring was converted into both meal and oil. The third building contains old boats used for herring fishing set up on recreated piers. Our visit happened to coincide with a local arts festival, with different members of the community showing off their talents. The boat building had musical acts, including a man playing an accordion, which definitely helped transport us back to the heyday of Siglufjörður and the herring industry. After finishing our scenic detour along the Tröllaskagi peninsula, we rejoined the Ring Road and then stopped for the night in the town of Varmahlíð. Our original plan was to camp in the town’s main campground, but it was packed with Icelandic families and we wouldn’t have been able to get a spot close to the WC. Instead, we headed back to a place we had seen on our way into town that looked more like a private residence but did have a camping sign. The sign gave its name as Lauftún. There was a large grass field that we just pulled into and picked a spot, then went up and rang the doorbell at the house. An older woman took our camping fee, which was by far the cheapest we paid all trip. It appeared to be a working farm, and Della had fun playing with the horses in the pen nearby. We later discovered a large room with seating and cooking areas that was being used by a local hiking club for their annual party. There was a small bathroom and a hot shower. We had both been reading the book “Burial Rites” which is set on an Icelandic farm in the 1830s and describes the traditional Icelandic farmhouse made out of turf, so we were excited to get the opportunity to see an example of one in person. Glaumbær is just up the road from Varmahlíð so we made it our first stop the next day. A farm has stood on the spot since Iceland’s “Age of Settlements” around 900 AD, and the turf farmhouse that you can tour was built in 1876. We used the self-guided tour brochure to explore the different rooms of the house. The walls are indeed made of thick pieces of turf, and the house has very few windows. The rooms are independent units accessible off of a single hallway, so they do not feel very well connected. One of the rooms we were most interested to see was the baðstofa, which served as the main sleeping and living quarters for all of the residents. It would have been very cozy confines during those long winters! We took a short detour off of the Ring Road to visit a small gorge with a pretty series of waterfalls. We took a short series of trails in either direction from the small parking area to get good views of the series of cascades. Note that there are no services here. We enjoyed our brief time in northern Iceland, seeing more beautiful sights and getting to learn a little more about Iceland’s history and culture. Next, we would again detour from the Ring Road and drive the circuit of the Snæfellsnes peninsula. The Mývatn region in the northern part of Iceland surrounding a lake (the eponymous Lake Mývatn) contains a large number of interesting geologic features related to the still-active volcanoes in the region. Since there were so many things to do there, we decided to spend a whole day exploring the region. Our first activity in the general area is not technically part of the Mývatn region. We approached the Mývatn region at the end of a long travel day that started in the southeastern part of Iceland, taking a slight detour towards the end of our long driving day to visit Dettifoss, the most powerful waterfall in Europe. We took the fairly new well-paved road to a parking lot on the west side of the falls. From there it was about a kilometer down a surprisingly barren path to see the Dettifoss. The water for the falls comes from the Vatnajökull glacier, the same one we had been exploring the day before. At the falls, there is both an overlook and a closer viewpoint. Would you imagine that a rushing waterfall is just down this path? There was an optional trail to Selfoss, another waterfall, but we were feeling tired so only walked far enough to see it from a distance. After getting a good night’s sleep (see below), we were ready to see the sights around Lake Mývatn. We didn’t end up taking the most optimal path between sights, but with our campervan it meant that we didn’t end up wasting too much time. Our first stop for the morning was the eerie lava fields of Dimmuborgir. We got there at 10 for a guided hike led by a park ranger. With her, we walked through the shorter loop, learning about the geology and flora of the area. We also saw the cave of the “Yule Lads”, 13 elf-like creatures (each with a different personality) that function like Santa Claus, bringing different gifts in the 13 days before Christmas. After the guided walk, we did the larger loop on our own to see the Kirkjan (Church) lava tube formation. All in all, we spent about two hours in the park, but would have spent less if just on our own. Note to future visitors: the bathrooms here require a fee. Also, the small gnats are quite annoying, and do not seem deterred by bug spray. Luckily, they do not bite. While self-catering our meals helped us save money, it did tend to get a bit repetitive. And, we had a hard time feeling like we were getting enough good vegetables. So, we decided to splurge and eat out for lunch at Vogafjós restaurant. It is attached to the cowshed of a local farm! Eric got a lamb sandwich, and Della got a crepe with rice and mushrooms. Both came with a salad with house-made cheese. And of course we had to get the ice cream made from the cows on the other side of the walls; it came with two flavors: geysir bread and schnapps. Being fans of Game of Thrones, we had to check out Grjótagjá, the small cave in the area with a thermal spring inside, made famous as the location of an intimate moment between Jon Snow and Ygritte. The cave was smaller than we expected, but the water was very pretty, and we could feel the heat rising off of it. Unlike the characters on the show, regular visitors are asked not to get in the water. We also enjoyed exploring the rift that the cave is formed from, and tracing its path all the way down to the rift we saw in Dimmuborgir. Walking through this area of orange soil, screaming steam vents, and bubbling mud pots made us feel like we were walking around the surface of Mars! What doesn’t come across in the pictures is the strong smell of sulfur that permeates the area. We found the whole area very fascinating and enjoyed taking it all in. After initially thinking it might be too tough, we changed our minds and decided to hike up the Hverfjall Crater which dominates the views around Mývatn. It only took us about ten minutes to hike up to the rim. The skies cleared into a sunny day, so we took about an hour to walk the circumference of the rim and take in the views of the surrounding area. As a literal hotbed of geothermal activity, Iceland is known among other things for a plethora of geothermal pools to bathe in. Some of the geothermal waters have been converted into full-scale facilities that are popular tourist attractions. The most famous is the Blue Lagoon near Reykjavík. The second most popular is probably the Mývatn Nature Baths. We visited these baths at the end of our long day exploring the Mývatn region. Before entering the pool, we followed the local custom of taking a full shower first (in gender-specific bathrooms). We were a little concerned about whether Della could swim in the pool, since she was six weeks pregnant at the time. But, we had read that it was ok as long as the water temperature was at or below body temperature. A constantly updating chart in the visitor center showed that one end of the pool met this criteria, so we spent almost all of our time lounging in the water there. Eric did explore a little bit of the warmer parts as well. The mineral-rich water has a cloudy consistency and left a smooth sheen on our skin. It was a very relaxing way to end out day exploring Mývatn! The main hub for the Mývatn region is the town of Reykjahlíð, which has a few camping options. We chose the Hlíð campground just outside of town because it was slightly less expensive and less crowded than the Bjarg campsite closer to town. We actually didn’t even take a spot, but instead just “camped” in the parking lot because that kept us close to the bathrooms for nighttime visits. The shared kitchen and dining facility is outdoors, but enclosed in plastic so it was pretty warm. We definitely enjoyed the wide variety of activities in Mývatn, and are glad we dedicated a complete day just to the one region! But, after the unique experience of camping in the same place for two nights, the next day we would hit the Ring Road again and continue on to more natural wonders of Northern Iceland. After exploring the waterfalls and other scenic sights of southern Iceland, we continued east on the Ring Road. Over the next day, we would have multiple chances to see different pieces of the massive Vatnajökull, the largest glacier in Iceland. As we drove along the Ring Road, we were able to get glimpses of the different “tongues” of the glacier spilling down over the mountains. As we neared one section of the glacier, the surrounding scenery was replaced by a flat plain with very little vegetation. This was the result of a jökulhlaup: a massive flood (filled with icebergs) caused by geothermal events rapidly melting a part of a glacier. The highway was broken up by many metal one-lane bridges that were quite scary to navigate (there are sections in the middle that are two vehicles wide to allow for waiting). This is because parts of the Ring Road had been washed away in a jökulhlaup in 1996. Compounding the stress of driving through this section was the fact that it started raining very hard! We were able to make it through the pouring rain to main entrance of this national park situated at the foot of a tongue of Vatnajökull. We were trying to find the trailhead for one particular trail based on a point on our maps app, but could not actually get there so just went to the crowded visitor center instead. It’s a good thing we did, because that’s where the trail started anyway. It was still raining, so we took some time exploring the visitor center and watching a film about the area, and eating a quick lunch in the car. We then put on a bunch of layers and headed out on the hike to Svartifoss. The hike was labeled as “easy” at the visitor center, and while it wasn’t rocky, it definitely included a steady and significant elevation gain. We got very sweaty under all of our layers, and it wasn’t even raining much anymore. The waterfall was not as big as the ones we had seen in the previous days, but its background of black basalt columns made for an unique setting. Glacial in the distance. Notice the layers! Just past Skaftafell was a dirt road turnoff for a viewing area of Svínafellsjökull, another tongue of Vatnajökull. This was our first chance to get a close view at a glacier. Just past the parking area is a small trail along the wall of a canyon that contains the massive amount of ice. We sat for a while and tried to take in the sheer amount of ice spilling down from the peaks above into the bay below. We continued on the Ring Road around the southeast corner of the island and starting heading north along the eastern coast. Our next stop was at Fjallsárlón, a glacial lake made where another tongue of Vatnajökull has formed a body of water and deposits icebergs. It is less well known and visited than the neighboring Jökulsárlón glacial lagoon (although still relatively crowded). We walked down to the shore of the lake and enjoyed the views of the icebergs on the water and Vatnajökull in the distance. We stayed here for about 40 minutes. A note to interested visitors: there is no public toilet here. Just up the road was Jökulsárlón, the more famous (and crowded) glacial lake filled with icebergs with a small channel connecting out to the ocean. We enjoyed watching as a few big icebergs started slipping down the channel, only to be caught on a shallow part. We followed the channel out the ocean and the black sand beach, where there were small remnants of icebergs that the ocean had pushed back onto shore. To cap off our visit, we walked back out to the main lagoon and watched the big icebergs in the middle, observing their different subtle behaviors. As we were leaving, we noticed a cool effect: the tide had started to come in, so the flow of the channel was reversed, pushing icebergs back into the lagoon. All told we spent over an hour here, and there were public toilets. We spent the night at the main campground in the coastal town of Höfn. Lonely Planet says the town’s name “is pronounced like an unexpected hiccup (just say ‘hup’ while inhaling)” – gee thanks, that really clears it up! The campground was fairly crowded but we were able to get a spot in one of the areas off to the side close to an ablutions. The main ablutions block with a kitchen area was a little far away, so we didn’t cook there, but we did wash dishes there, take hot showers (fee required), and spend time in the indoor heated area. The next day was a long travel day, as there were not any sights that we were particularly interested in seeing along the eastern part of the country. However, the drive was scenic, weaving along the coastline and then in and out of the eastern fjords (with Eric taking his first turn driving the manual transmission campervan). One unexpected highlight was a black pebble beach just off the road, part of Hvalnes Nature Reserve. It was nice and sunny out, which had warmed the smooth black pebbles to a toasty temperature. Della really enjoyed laying on these warm stones and soaking in the heat. By the end of our long driving day, we had bid goodbye to the wonders of Vatnajökull and its associated tongues and lakes, and were back along the continental divide in the magical area of Mývatn, which will be the subject of our next post! In some ways it’s hard to know what to say about my dad. I’m supposed to be sharing my memories, but given his disease, the word “memory” takes on a different connotation. How can we talk about memories when his own memories were lost? And when his memories were lost, his family’s memories of him changed, as he himself did. So today I don’t want to remember the way he was after the disease ravaged his mind, because that wasn’t him. I want to remember the dad that did a great job raising his two children and had a lot of fun along the way. While I was reflecting on my memories, I came to the realization that my dad was a “cool dad.” On sitcoms, the standard trope is that kids are always embarrassed to be around their father, and cringe when he tries to hang out with them and their friends. But in my dad’s case, I don’t think that was true at all. When I was in elementary school, he came in to give a career day presentation, talking about his profession as a commercial artist. I remember feeling very proud, because the other kids loved his presentation. He wasn’t talking about boring adult jobs – he was able to draw things for a living! And all of his pictures that he brought in to show were quite impressive both to the class and to me, with their precise lines and accurate renderings of real objects. It was also pretty cool to see his work out in the real world, whether it be in the newspaper or on the album cover of this little local bluegrass band named the Dixie Chicks. 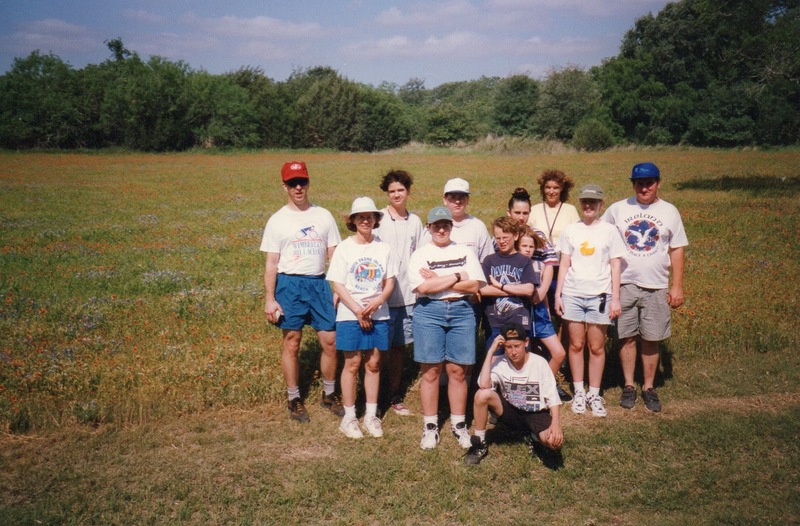 Since he was self-employed, he was able to serve as a chaperone on many of my field trips. Rather than be annoyed that he was around, I was happy, because I thought it was fun to spend time with him, and I thought my classmates did too. His goofy sense of humor helped him fit right in. The most impressive example of this was when he came on a multi-day trip to Big Bend, driving a van full of rowdy teenage boys all the way out to West Texas. Those of you who have been to Big Bend know how far that is from here, so that was quite a feat! My dad also helped lead the youth group at our church for many years, and here also his affable style was a great fit for the group. In our many Sunday night sessions, we became quite a bonded group, led by his caring and friendly style, with a lot of laughs mixed in. I also have very fond memories of the two of us driving back from those youth group meetings, listening to the “Beyond Bows and Arrows” radio show of Native American music which we both found fascinating. We shared a lot of inside jokes as well. Every morning, we would both read the Mark Trail comic strip and then laugh at the unintentional irony of the adventures those characters got into. Also every morning, my dad would drive me to the bus stop for my bus into school. We would always listen to the Musers on the Ticket, and their fake characters and other hijinks would be a constant source of jokes between the two of us. 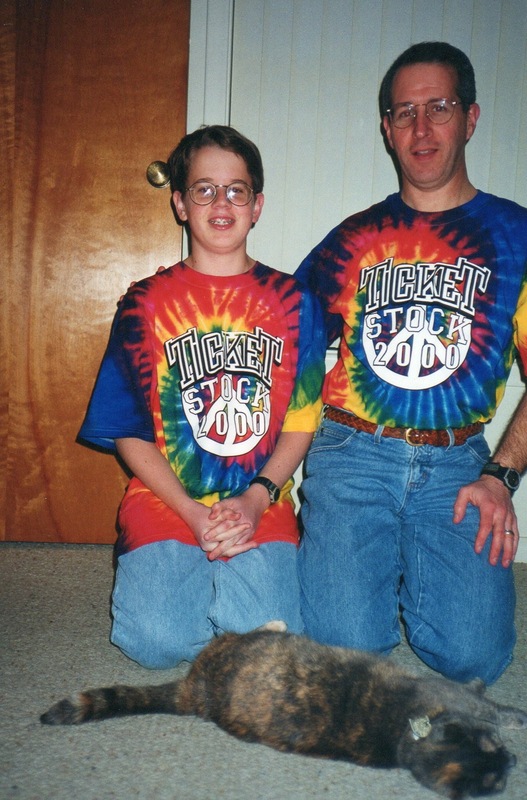 My dad and I listened to the Ticket from basically its beginning as a station, and would go every year to the first night of Ticketstock to get the free t-shirt and see the hosts. I still listen to the Ticket today even in Denver, and get a smile on my face when I hear something that I know would have made my dad laugh. My dad wasn’t the cool dad just because he was funny – I was also in awe of his bike riding habit. As often as he could, he would go out riding with his friends, and pretty serious distances too. I was impressed if I could just make it around White Rock Lake, and he was able to do rides like a 100 mile ride in the summer heat of Wichita Falls, all without complaining about the difficulty! He was also a brave dad – he beat prostate cancer when I was in college. I remember visiting him in the hospital, where he didn’t ever want to make a big deal out of it. And then, as he recovered, we spent the summer catching up on old seasons of The Sopranos together, back before binge-watching was a thing. He was a natural at getting to know people around him. When he was self-employed, I would visit him at his office occasionally, and often on Fridays he and his officemate would go out to the hamburger restaurant Chips for lunch. Going to Chips with him felt like we were going to visit with his group of friends – he and the cashier called each other “Cookie” and would exchange the same coupon back and forth each visit. He got to know one of the cooks well enough to learn about his family back home – which had a nice benefit for me, because whenever I ordered a grilled cheese, it would come to me as a double decker because they knew I was Steve’s son. 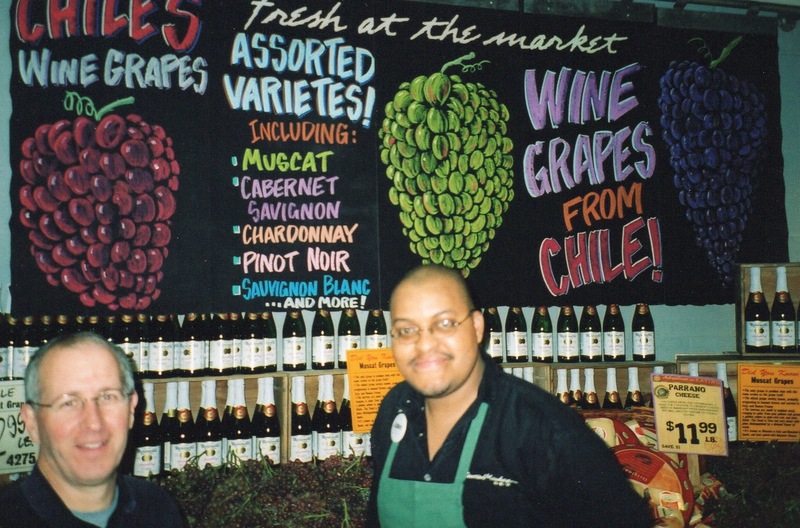 When I would visit him at his last job at Central Market, again it was like he was friends with everyone in the store. When we walked with him through the store, he would be greeted warmly by people from every department. He even became friends with the Sudanese refugees who helped bring the carts in. After he retired from Central Market in 2009, he came out to Colorado to join me and Della on a raft trip with her family. On this trip, the two of us shared a tent, and one night, after a few beers, he confided in me the fears about what was happening to him – “my brain is turning to mush” was how he put it. So when I think about his passing, I am not sad for him, because I know the fear and confusion I heard in his words that night has now gone for him. What I mourn for is that so many people will not have a chance to get to know the Steve that I knew growing up, including his grandchildren. So I hope all of those here who have those memories will help keep them alive. My dad’s favorite movie was undoubtedly “Dances with Wolves.” When I was young, we would watch it together at least once a year. Even as his disease progressed, one of the best ways that caregivers could calm him down was to pop in the dvd of “Dances with Wolves” and play it on repeat. In the final scenes of the movie, the main character has to leave the tribe that he has come to know as his family due to circumstances outside of his control. As he leaves, a member of the tribe shouts from a hilltop at him “Do you see that I am your friend? Can you see that you will always be my friend?” I think that my dad’s passing is kind of like this. Circumstances out of his control caused him to have to ride away from us sooner than he would have liked, and with a sense of sadness. As he rides away into the next life, I am shouting after him “Do you see that I am your friend? Can you see that you will always be my friend?” And I think, now that his mind is once again clear, he knows and remembers that all of us were, and will always be, his friend.